Beautiful day today. Makes me feel guilty that I want to lie around and have a Dexter marathon. Just so you know, November is Epilepsy Awareness Month. Rock some purple. This morning Connor discovered that toes are more than just toys. They are tasty treats! Good thing my foot phobia doesn’t extend to baby feet. 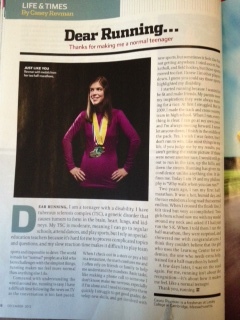 And finally, on p. 52 of December’s Runner’s World, they feature teen runner Casey Revman, who has TSC. Great article.